Sometimes we need to pause from our own busyness, or a focus on self, and become aware of what could be happening to people around us. This is an unusual story. It deviates from the career and job search articles I normally write, but life happens. It will cause you to pause and reflect on some of what could be going on in the lives of some of the people around us. I had just dropped my husband off at the train station for a trip into Toronto. On my return I stopped at the grocery store for one item. I didn’t need a flyer, but it’s customary for me to pick one up as I am entering the store. The flyer stand was empty, but I saw one tucked far inside a shopping cart, requiring me to put in the quarter to retrieve it. I went straight to pick up the item I needed, but it was sold out. You are now wondering where I am going with all this detail, but bear with me. “God brought me into this world as everyone else. What’s my mistake in it? How am I supposed to be blamed for this? I have kids. I want to live for them; watch them grow into good human beings. I am really sorry if God made a mistake by bringing me into this world. What’s my mistake where no one loves me!! My existence doesn’t affect[s] anyone!! Life is like an extra baggage!! Fed up of it since last 12 years. I want to be loved by someone. Don’t I deserve to be loved!! What’s the point of living!! Holy! My head started spinning as I re-read the note. I paid for the items and left. As I entered my vehicle, I thought of the pain that that woman was (and is) going through, wondered where she was at that moment, and said a prayer for her. This popular quote: “Be Kind; Everyone You Meet is Fighting a Hard Battle”, kept going through my mind. Wouldn’t a kind word or a shoulder to cry on have eased her pain that day? We interact with people every day: at work, on the train, in the mall, at the grocery store, and at home. Some have smiles on their faces; others don’t, yet we are not always aware of what’s going on in their lives. As a career coach, I collaborate with people facing career and job search challenges, whether it is a resume that isn’t communicating value; difficulty landing a job after several interviews; lack of career progression in the organization, or someone who is stuck, confused and, yes, fed up. I have also had individuals contacting me for job search services, but early into the conversation we both discover they are dealing with issues that need to be resolved before we proceed. While not often, there have been cases where the issues are far outside my professional competence. In such cases I would refer the individual to a therapist or mental health professional trained to handle such matters. These are real life battles and a lot of baggage for some people to carry. How can we help? Or, how about you? Do you see yourself in any of the above scenarios? Are you feeling stressed and overwhelmed? Are you having thoughts like the woman who wrote that note? If the latter, seek professional help, starting with your company’s Employee Assistance Program (EAP), if there is one. If not, find someone you can talk to, or search for local organizations that offer counselling support. By this I hope you now understand why this article did not focus on the job search or resume writing, and why I went into details at the beginning. There was probably a reason I went to great lengths to get the flyer even though I didn’t need it. I could’ve walked straight in the grocery store, picked up the item and left. But, probably it was to give me something else to write about outside my usual career topics. I don’t know. Life happens outside of our jobs and careers. Sometimes we need to pause from our own busyness, or a focus on self, and become aware of what could be happening to people around us, and even those we don’t know. 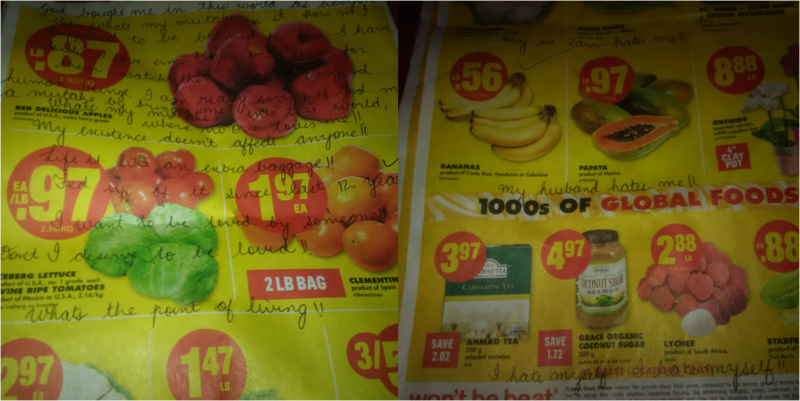 That woman who told her story on that supermarket flyer was crying out and sharing her pain. She could be a family member, a coworker, a neighbour, or friend. We don’t know. What we do know is that we need to help carry one another’s burdens. Sometimes it’s as simple as a short conversation, a listening ear, zipping our lips before a hurtful word escapes, or taking the time to be kind. Kindness doesn’t cost anything. What would make your role in this department/company more fulfilling? Do you think you are currently performing up to your potential? Why or why not? What does success mean for you? What would a successful life look and feel like? What do you want the rest of your life to be about? Are you feeling overwhelmed? How do you release stress? What do you do to look after yourself on a regular basis? How do you enjoy yourself? You might not have to ask or get an answer to all the questions, but that’s not the point. You shifted gears and took the time to make a difference in that person’s life. On a scale of 1–10, life is not a perfect circle. There are ups and downs. If you are at a point where you want to take stock of your life or career, why not sit with a notepad in a quiet place and take a look at your life to determine what could be contributing to or impeding your progress or overall happiness? Find out what’s working in your family, job, career, friendships, finance, health, etc. and what’s not working. Rank them on a scale of 1–10. If they are low in most areas, it’s time to reach out for help from a trusted friend or a coach. In the meantime, take care of yourself and be kind to everyone you meet. They might just be fighting a very hard battle. Need a quick chat about your career or job search? Give me a call pronto! Originally published at www.daisywright.com on January 28, 2017. A certified career management and leadership coach, I point people in the "Wright" career direction. Collaborating with executives, managers and mid-career professionals, we work on career strategies to help them get hired FASTER! Known as the CEO (Chief Encouragement Officer), my positive ‘can do’ attitude is contagious. I have authored two books, contributed to more than 10 others (on career coaching, resume writing and job search), and I have been featured in the Spotlight on Communicators section of the college text book "Business Communication: Product & Process” (on Page 578), alongside Oprah, Diane Sawyer, Colin Powell and Michael Dell. My stint with UNIFEM (now UN Women) in New York, was an experience that cemented my passion for women’s issues. My recently launched mini non-profit, the Let’s GROW Project, is a work in progress designed to offer a brief brief high-touch high-value coaching session to women who have never benefited from coaching. Connect with me on LinkedIn: http://www.linkedin.com/in/daisywright, and Twitter: @CareerTips2Go. 5 things I wish every mum returning to ‘work’ would always remember.